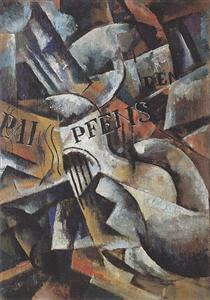 Popova was born in Ivanovskoe, near Moscow, to the wealthy family of Sergei Maximovich Popov, a very successful textile merchant and vigorous patron of the arts, and Lyubov Vasilievna Zubova, who came from a highly cultured family. Lyubov Sergeyevna had two brothers and a sister: Sergei was the eldest, then Lyubov, Pavel and Olga. 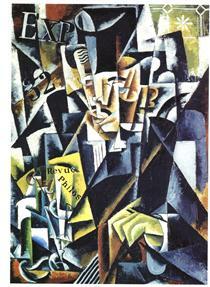 Pavel became a philosopher and the guardian of his sister's artistic legacy. She grew up with a strong interest in art, especially Italian Renaissance painting. At eleven years old she began formal art lessons at home; she was first enrolled in Yaltinskaia's Women's Gymnasium, then in Arseneva's Gymnasium in Moscow. By the age of 18 she was studying with Stanislav Zhukovsky, and in 1908 entered the private studios of Konstantin Yuon and Ivan Dudin. 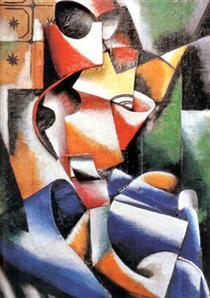 In 1912 to 1913, she began attending the studios of the Cubist painters Henri Le Fauconnier and Jean Metzinger. Popova traveled widely to investigate and learn from diverse styles of painting, but it was the ancient Russian icons, the paintings of Giotto, and the works of the 15th- and 16th-century Italian painters which interested her the most. In 1909 she traveled to Kiev, then in 1910 to Pskov and Novgorod. The following year she visited other ancient Russian cities, including St. Petersburg, to study icons. 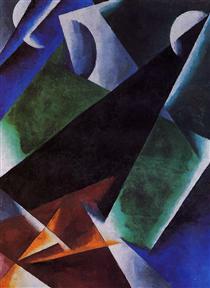 In 1912 she worked in a Moscow studio known as "The Tower" with Ivan Aksenov and Vladimir Tatlin, and also visited Sergei Shchukin's collection of modern French paintings. 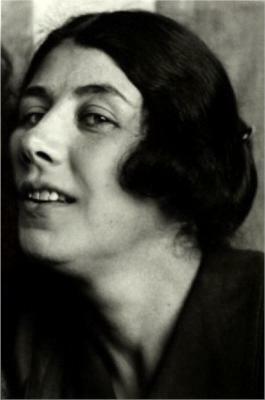 In 1912–1913 she studied art with Nadezhda Udaltsova in Paris, where she met Alexander Archipenko and Ossip Zadkine in 1913. 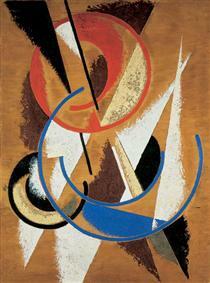 After returning to Russia that same year, she worked with Tatlin, Udaltsova and the Vesnin brothers. 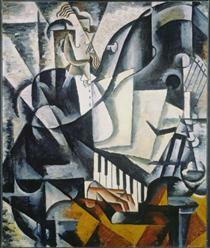 In 1914 she traveled in France and Italy at the development of Cubism and Futurism. 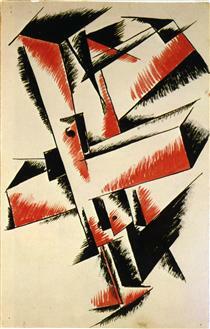 Popova was one of the first female pioneers in Cubo-Futurism. 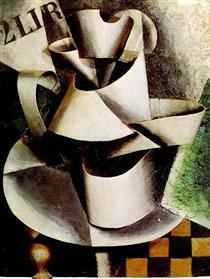 Through a synthesis of styles she worked towards what she termed painterly architectonics. 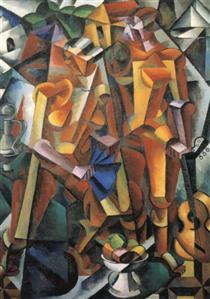 After first exploring Impressionism, by 1913, in Composition with Figures, she was experimenting with the particularly Russian development of Cubo-Futurism: a fusion of two equal influences from France and Italy. 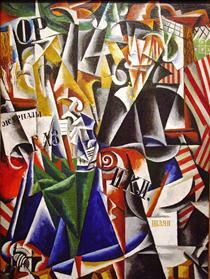 From 1914–1915 her Moscow home became the meeting-place for artists and writers. 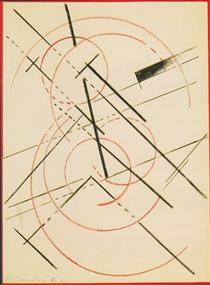 In 1914–1916 Popova together with other avant-garde artists (Aleksandra Ekster, Nadezhda Udaltsova, Olga Rozanova) contributed to the two Knave of Diamonds exhibitions, in Petrograd Tramway V and the 0.10, The Store in Moscow. 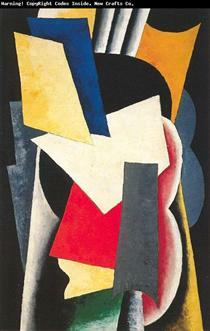 An analysis of Popova's cubo-futurist work also suggests an affinity with the work of Fernand Leger, whose geometry of tubular and conical forms in his series of paintings from 1913–1914 is similar to that in Popova's paintings. 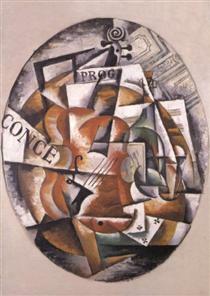 Her painting The Violin of 1914 suggests the development from Cubism towards the "painterly architectonics" series of 1916–1918. 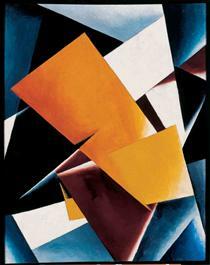 This series defined her distinct artistic trajectory in abstract form. The canvas surface is an energy field of overlapping and intersecting angular planes in a constant state of potential release of energy. At the same time the elements are held in a balanced and proportioned whole as if linking the compositions of the classical past to the future. 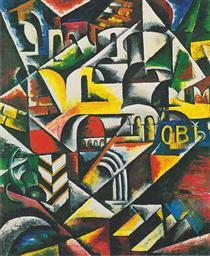 Color is used as the iconic focus; the strong primary color at the center drawing the outer shapes together. 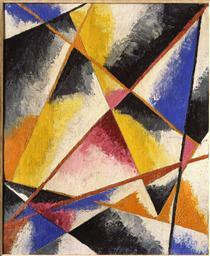 Lineare Composition Lyubov Popova ? 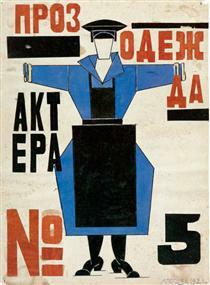 Production Clothing for Actor no.5' in Fernand Crommelynck's play 'The magnanimous Cuckold' Lyubov Popova ? 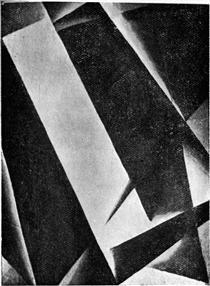 Space Force Construction Lyubov Popova ? 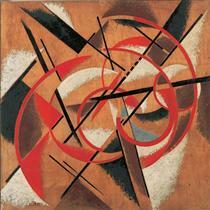 Spatial Force Construction Lyubov Popova ?